It becomes clear that the number of parameters grows linearly with the size of the network, i.e. the number of variables, whereas the size of the JPD itself grows exponentially. Given a discrete representation of the CPD with a CPT, the size of a local CPD grows exponentially with the number of parents. Savings can be achieved using compact CPD representations—such as noisy-OR models, trees, or neural networks. The collection of independence assertions formed in this way suffices to derive the global assertion of the product rule (or chain rule) in (2.2), and vice versa. 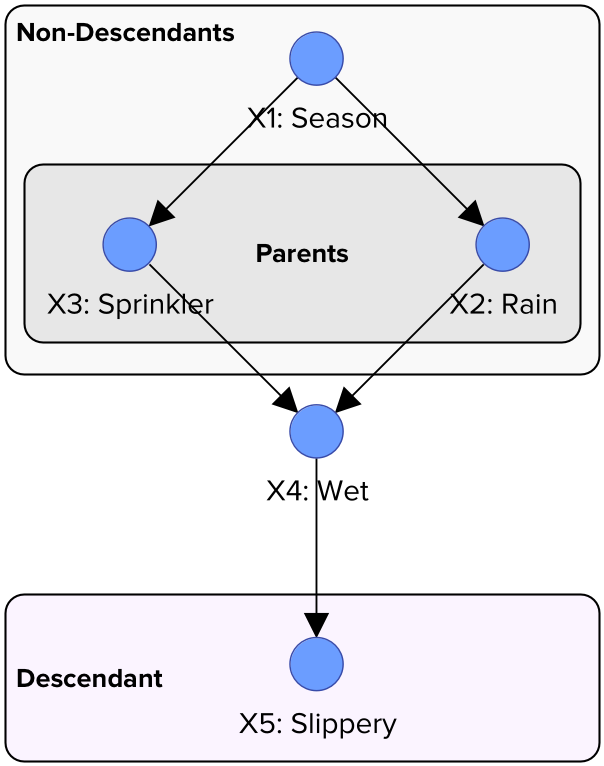 The local semantics is most useful for constructing Bayesian networks because selecting as parents all the direct causes (or direct relationships) of a given variable invariably satisfies the local conditional independence conditions. The global semantics leads directly to a variety of algorithms for reasoning.